There was a genuine sense of intrigue as I fired up Bendy and the Ink Machine for the first time. A very unique looking game that you wouldn’t necessarily guess was a horror title at first glance. Safe to say, I didn’t really know what to expect, but upon playing, other than the visual style, my first impressions during the first chapter wasn’t particularly great. Things did get better, but without ever getting to the level I had hoped it would, as there are some issues preventing it from doing so. Players take control of Henry, a former cartoonist of the Joey Drew animation studio. He has been welcomed back to visit his old workplace, only to find it in complete disarray, the complete absence of anybody else around, rather worrying writing adorning the walls written with ink, planks across doors keeping you from getting in and just a downright eerie vibe to the place in general. Bendy and the Ink Machine started life as an episodic title (which I am never a fan of), but Switch owners have the opportunity to play through the entire package without having to wait between the admittedly short episodes. Each one varies in length but you’re looking at completing the entire game in about two hours and I think that goes for most players, not just those that are adept at games. I’m not saying that every game needs to be a twenty-hour epic, but when we’re talking about an episodic game where the first episode took me less than twenty minutes to finish, I expect a little more. The gameplay here is undeniably basic, which can be a problem but in a way helps you as the player feel a bit more vulnerable at the same time. The slow-paced gameplay does help build the atmosphere up a lot more naturally and as such, the world feels eerier as a result. To counter this, for the most part, you will be required to complete a number of fetch quests that make this atmosphere that has built up, to dwindle slightly. I don’t really have a problem with fetch quests providing they aren’t constant and/or require me to look around the exact same areas that I have been picking at with a toothpick for the last fifteen minutes and nothing has really changed. Combat is where things get pretty bad as it seemed to me that the developers behind Bendy and the Ink Machine felt like they had to include some form of combat because seemingly every other game out there does too, which shouldn’t be the case. Bendy and the Ink Machine could have worked perfectly well without the need of combat at all. You will grow frustrated as you miss an attack for the fifth time in the last minute, even when it seems like you should be hitting the enemy. It is a shame, as it does detract from the overall experience and dampens the enjoyment slightly. Without going into anything too spoilerish, there is a larger fight at some point during the game and this is when the game is at its absolute worst so be warned. All because of how bad the combat is. I think what also doesn’t help, and maybe only me thinks this, is that there is an air of BioShock in here. I can’t pinpoint the specific aspect as I think it was more of a combination of many things, but my mind kept wandering off whilst playing and I could not stop thinking about BioShock. First person perspective, tape recordings, a melee weapon similar to what BioShock has and even the way the game brings up notifications. The biggest one for me was that its setting is a place that was once great but has now turned into a shadow of its former self. I know that it’s not totally fair on Bendy and the Ink Machine to compare the two, as one is one of the greatest video games ever made, but as I said, it doesn’t help itself. It’s like creating a fighting game like Super Smash Bros. but not having the roster or the gameplay to back it up. (PlayStation All-Stars Battle Royale by the way, if it wasn’t obvious). 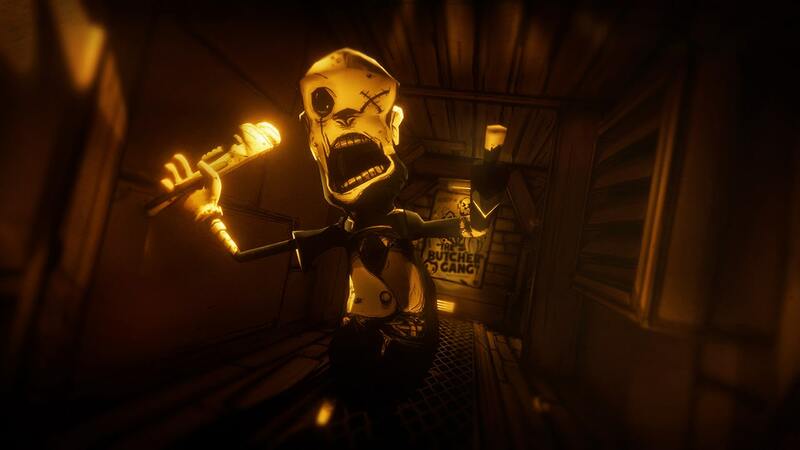 The horror element in Bendy and the Ink Machine isn’t solely a jump scare one, although there are a few dotted around here and there to keep you on edge. The horror aspect mainly comes from the anticipation of being spotted by enemies and the urgency of running away and hiding. The enemy designs complement this and I love the thought that clearly went into making these monsters, as they are all downright creepy, especially the star of the show, Bendy. The creepy mood is kept throughout the game and is thoroughly impressive given the cartoony look the game goes with. Bendy and the Ink Machine is a very intriguing game. It has an incredible visual style that is unique and certainly has some good horror elements going for it, but it, unfortunately, lets itself down in other areas. Straightforward puzzles, unwanted fetch quests and a clunky combat system really hurt the enjoyment in a big way. However, it is an interesting take on the horror genre and can still be thoroughly enjoyable in the right hands. I do think little more time in the oven was needed.